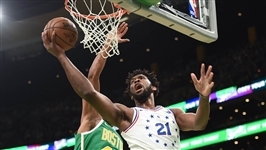 This past Christmas (12/25/2018) in a nationally televised primetime ABC game, the Philadelphia 76ers played host to the Boston Celtics and came up just short in a 121-114 OT thriller. Leading the way for the Sixers was star center Joel Embiid, who poured in 34 points and pulled down 16 boards. He went a perfect 12-for-12 from the line and shot 10-17 from the field, even knocking down a pair of threes. 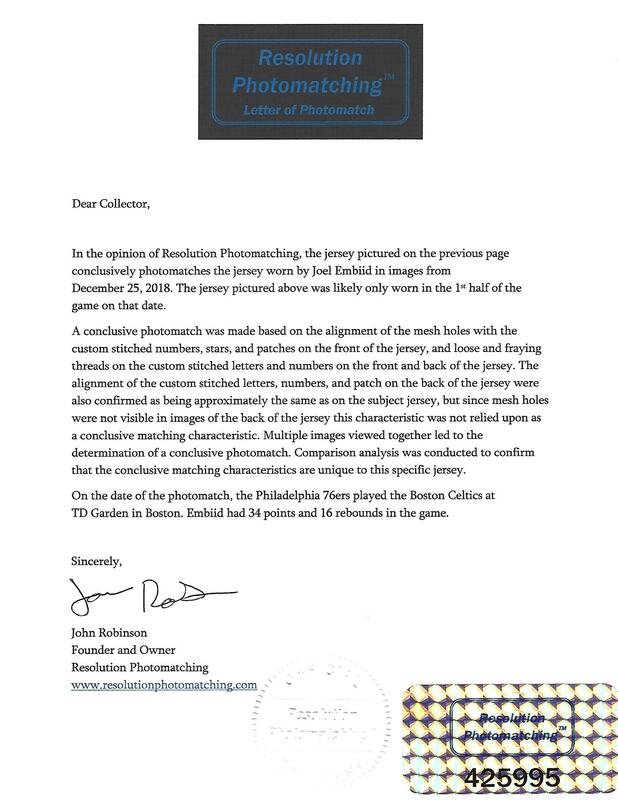 Featured here is the photo-matched home jersey Embiid was wearing that evening in the City of Brotherly Love. The 7-foot center from Cameroon has taken the league by storm since being drafted #3 overall by the Sixers in 2014. After losing two years due to injuries, the likeable, smack-talking character has convinced everyone to "trust the process." As the Eastern Conference playoffs arrive, the big man looks to build on his 2018-19 season that saw him set career highs in points (27.5), rebounds (13.7) and assists (3.5), and perhaps guide the Sixers to the promised land. On the jersey’s left front tail is the proper Nike manufacturer’s tagging including size “52” and a flag tag reading “LENGTH +6.” Also included is the coded NBA Authentics tagging. “PHILADELPHIA, USA” is impressed above the Nike tagging in script. Someone, presumably the team trainer, has marked a "1" in black pen to indicate the half this shirt was worn. 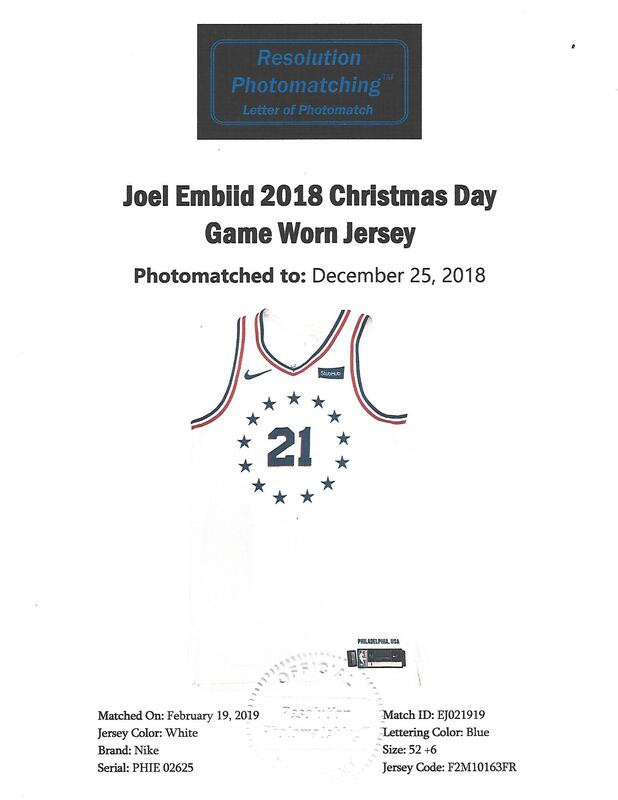 Across the front of the white polyester jersey is Embiid's player number "21" encircled by 13 blue stars in honor of the original 13 states of the U.S. A larger "21" appears on the back. Numbers are done in blue tackle twill shadowed in red. 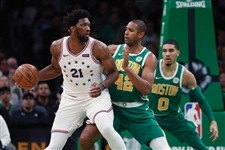 His last name – “EMBIID” – is arched across the back in blue tackle twill sewn directly onto the jersey. The arms and collar are sporting the Sixers red, white and blue elastic trim. A patch touting the team’s sponsor “StubHub” appears near the left shoulder, while a blue Nike swoosh adorns the right side. The official NBA red, white and blue logo appears near the top of the back of the jersey just below a gold patch that reads “3” in reference to the number of NBA titles claimed by the franchise (1955, Syracuse Nationals; 1967, Philadelphia Warriors; and 1983, Philadelphia 76ers). The jerseys shows appropriate game use with some fraying and stretching. A fantastic example with tremendous documentation. Includes LOA from Resolution Photomatching. The experts there have made a conclusive photo-match to the 12/25/18 game using several game images based on the alignment of the mesh holes with the custom stitched letters, numbers, stars and patches, as well as the loose and fraying threads on the custom-stitched letters and numbers.